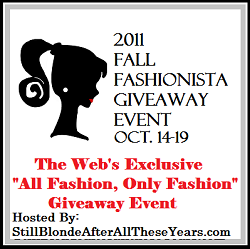 Welcome to the 2011 Fall Fashionista Giveaway Event! The 100+ bloggers participating in this event are so excited to bring you the chances to win thousands in drool-worthy fashion items! You can enter at each blog participating and enter for the grand prize of a Fendi Mini Beige Red Pochette Bag!! 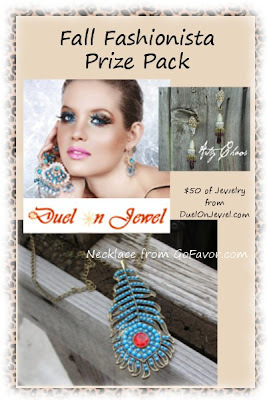 Here at Artsy Chaos you can enter to win over $60 worth of gorgeous fashion jewelry sponsored by DuelOnJewel.com and GoFavor.com. To find all about these great sponsors, please visit our review posts for Duel On Jewel and Go Favor. Please use the Rafflecopter form below to enter the giveaway here. You may do either mandatory entry to enter; you must complete both to unlock extra entries. Make sure your java is up to date and be patient, the form may be slow to load. If you are unable to see either the entry form or the GFC widget to follow us, please refresh the page and that should do the trick! After you enter here, use the linky at the bottom of this post to hop to another participating blog and enter their giveaway. You can enter them all for chances at winning! Good luck! Love the Oval Green Stone Statement Ring. Like the Personalized Brown Zircon&Rhinestone Strawberry Stud Earrings from Go Favor. GoFavor.com - I like their "Elastic Crystal Beaded Strand Note Charm Bracelet"
I love the silver Plate Dangle Earrings in red with the Victorian Finish. I can't believe the prices on GoFlavor. I am going to check out the freight, because there was so much I would love to get. The chandler earrings, flower rings, and etc. I love the Carnelian Ring & the Rose Quartz ring! I really like the Vintage Leaf&Key&Heart Tassel Charm Bracelet! From Duel N Jewel, I like the Sterling Silver Chain Anklet. I also like the White Pearl Bead Armlet. From GoFavor.com, besides the giveaway item that I LOVE, I also really like the Vintage Peacock Pendeant Teardrop Bead Chain Necklace and the Vintage Hollow Peacock Pendant Chain Necklace. I like the Sterling Silver Pendant with Red Onyx and Marcasite from the Duel on Jewel website. I like the Chandelier Earring in Silver Tone from the Duel on Jewel website. I loved the Vintage Red Rhinestone Elephant Ring at the GoFavor website. I love pearls, and the Freshwater Cultured White Pearl Pendant Set is gorgeous. I love the Vintage Royal Flower Chain Bib Necklace from Go Favor. The flower Pendant Set in Enamel and Sterling Silver is beautiful, and very much my style, but I like the Mystery Blue Glass Bead Fashion Necklace almost as much. I would wear the Elastic Beaded Strand Silver Tone Engraved Flower Bracelet in an instant! Beautiful! At GroFavor i like alot of their stuff but i would pick the gorgeous teardrop pendant necklace. I love the vintage bohemian long chain pendant locket necklace from gofavor.com! I think the Vintage Engraved Heart Lockets Necklace is pretty!
. One of the ethnic Kundan bracelets. I am originally from India and am very familiar with this style of jewelry.
. Oxidized Black Crystal/Cubic Zirconia Necklace Set. I love the ethnic and vintage jewelry in their collection. The 2 items that compliment my style would have to be the Black Sand Stone Pendant in Sterling Silver and the Antique Gold Plated Set . The Mystery Blue Glass Bead fushion necklace totally compliments my style! Everyone needs a set of pearls! I like the sterling silver dangle earrings and the marcasite and pearl necklace. At gofavor.com I love the prices! I also like the antique silver drop earrings. :) At their price I think i have to get a pair! The Black Sand Stone Pendant in Sterling Silver! From Gofavor.com I love the Vintage Cream Colored Rose Pendant Long Chain Necklace. Two items that compliment my style at Duel on Jewel are the Crystal and Gold colored Bead Pendant (ON SALE for only $12! )and Earring and the Cubic Zirconia and Turquoise Pendent Set. They have a ton of gorgeous jewelry there! I love the Blue Turquoise Waterdrop Pendant Necklace at GoFavor.com! Simulated Emerald Earrings and pendant with Cubic Zirconia. I like the Cubic Zirconia and Maroon Pendent Set from Duel on Jewel. I like the Sterling Silver Pendant with Red Oynx and Marcasite! The White Pearls and Star Charms Anklet, and the Silver Plated Dangle Earrings in Red with Victorian Finish, would nicely compliment my style. Thanks for a great giveaway. Love several of the earrings including the Vintage Silver Tone Rhinestone Studded Filigree Flower Dangle Earrings and the Vintage Silver Tone Filigree Wintersweet Drop Earrings. LOVE!!! this ring from GoFavor.com Vintage! Vintage Adjustable Bohemian Round White Pearl Cocktail Ring.